Since I started this series I decided I should publish a little “How to” for blazers. They are so versatile but sometimes that can be really overwhelming when creating an outfit. So here ya go! Step One: Blazing it up. Find a great structured blazer. If you don’t have one already I would recommend black or navy as they are very neutral and can go with many blouse options. Step Two: Top of your game. A soft blouse/ t-shirt or sleeveless shirt to go under the blazer. For a more casual occasion I go with a plain t-shirt and for a dressier occasion a blouse. Feel free to spice it up with a pattern or a bright color! Just remember your shoes and accessories will need to compliment one another. Step Three: A mean jean. A well fitting pair of jeans. Remember jeans can be colored or regular. Whatever you feel most comfortable in or whatever color is suiting your mood! I prefer a dark wash denim with my black blazer. It gives it that dressed up crisp look. But when I am going more casual a light wash jean is my “go-to”. Step Four: Pump it up. A nice pump really helps balance the jean and blazer look. Gives you classy and edgy look. 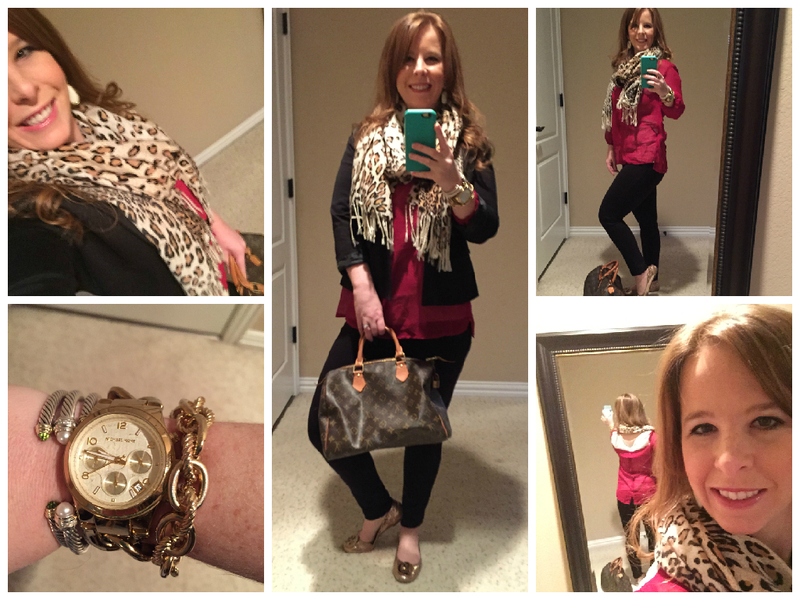 Go for a fun color (magenta) or pattern (leopard)! Step Five: Bling, Bling. 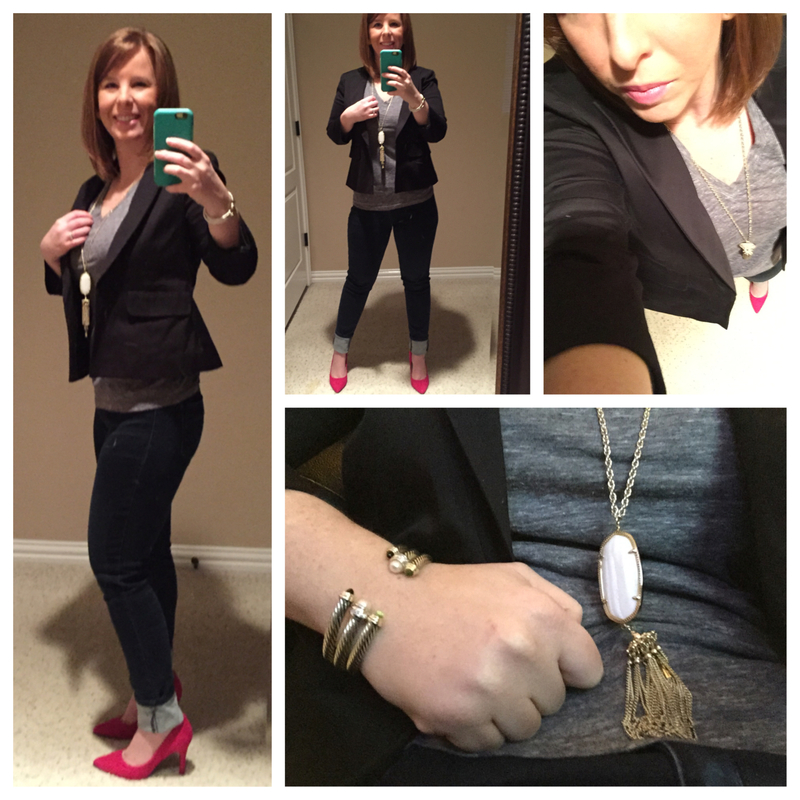 A statement necklace is the icing on this outfit. If you haven’t gone bold with your shoes, or top here is where you can make your impact. Step Six: Show em’ what you got. Have fun in your new outfit! With Autumn officially beginning I have a slew of outfits to show you over the next few weeks! If you follow my Instagram you saw I have I hit it big when I went to the outlets in San Marcos. The sweater from that trip was the base of this outfit and I built from there! Are you excited to add new pieces to your wardrobe?